NEW ALERT!! THESE ARE FORGERIES!!! READ ON! 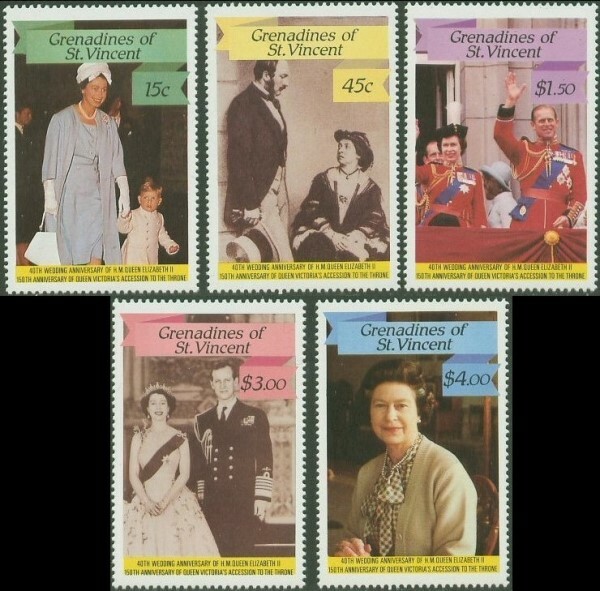 In October 1987 (before the normal set was issued) the infamous St. Vincent Inverted Frame errors on Scott# 1017-21 appeared on the market. Some shady stamp	dealers presented these as legitimate errors and sold them to unknowledgeable collectors and dealers for large sums. In actuality these 'errors' were produced by the Format Printers on purpose to promote collector interest. The frame plates were purposely inverted. 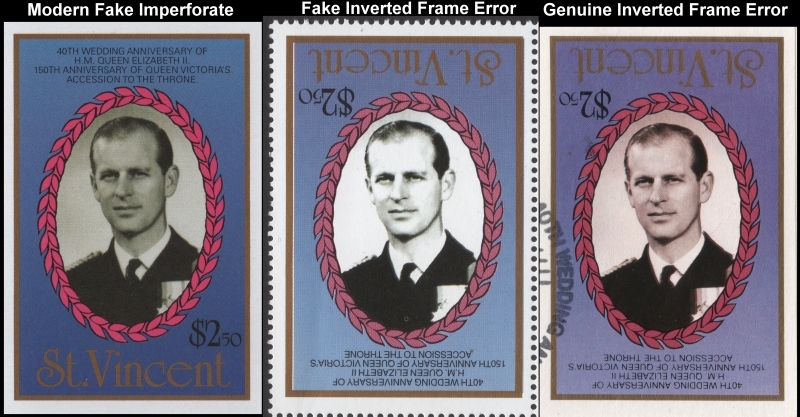 Some shady dealers/sellers with ties to the company presented these at the time of appearance stating	that only 200-250 of these 'errors' exist even though the printers revealed that more than that were produced. According to what little documentation still exists 2,500 sets with inverted frames were printed on special order. This is proven from one of the documents used as part of exhibit 46 in the trial against the printers of which they were proven not guilty of any wrong doing. You can view this document which is linked below. As we can see by this document the order for 10,000 stamps by the P.D.C. 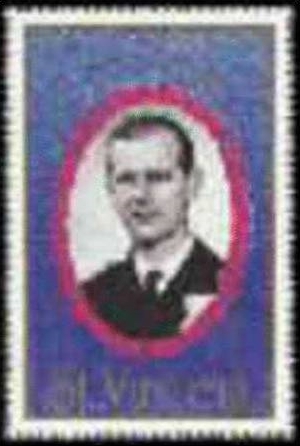 (Philatelic Distribution Corporation) under direction of Clive Feigenbaum was placed for 4 values. It is known that the four low values of the set were printed on one press sheet. The $5 value was printed separately. Note the order is dated March 23, 1988. This is four months after the issue date. According to the reprint agreement the PDC could order reprints up to six months after the issue date according to their needs. For promotional and packet reprints it states in the reprint agreement that the stamps can be reprinted but without the top two values. Since this set only has five values it was deemed that only the high value not be reprinted and that is why the estimate calls for only four values. This document shows the number of panes. Basically this shows	that 100 panes of each value would result. 100x25=2,500 singles of each value. Thus we have a finite number that can exist of genuine invert stamps printed by the Format Printers. All others were never printed there. Any catalogs stating otherwise and written/produced in the '90s are inaccurate and possibly	biased toward the writers personal gains. and did never produce these stamps secretly to sell to unaware collectors under the pretext that they were ACTUAL LEGITIMATE ERRORS. 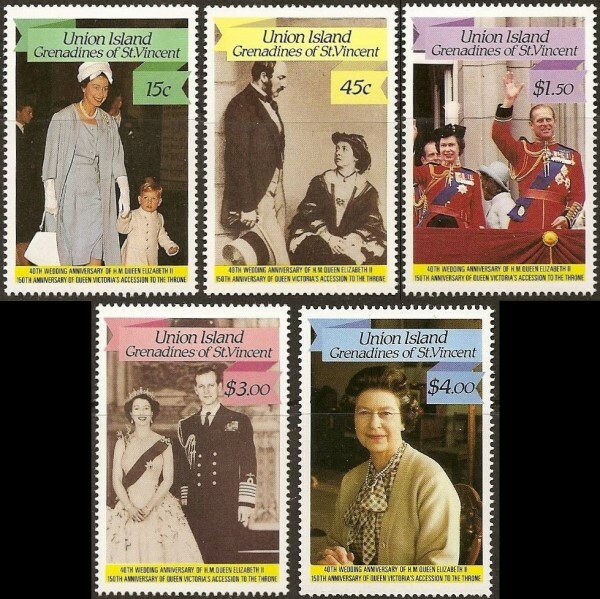 From present day analysis and personal buying endeavors these stamps have a value of no more than $5-10.00 for a set of four. Anyone asking more is OVER INFLATING the value and should NOT be dealt with on ANY stamp dealings at all! They were made for collectors and are not rare! The above imaged set of blocks was purchased for $25.00! Yes, the whole set of blocks! I have discovered there is a big problem with them! I WAS DUPED IN 2010! The imaged blocks are all fakes! 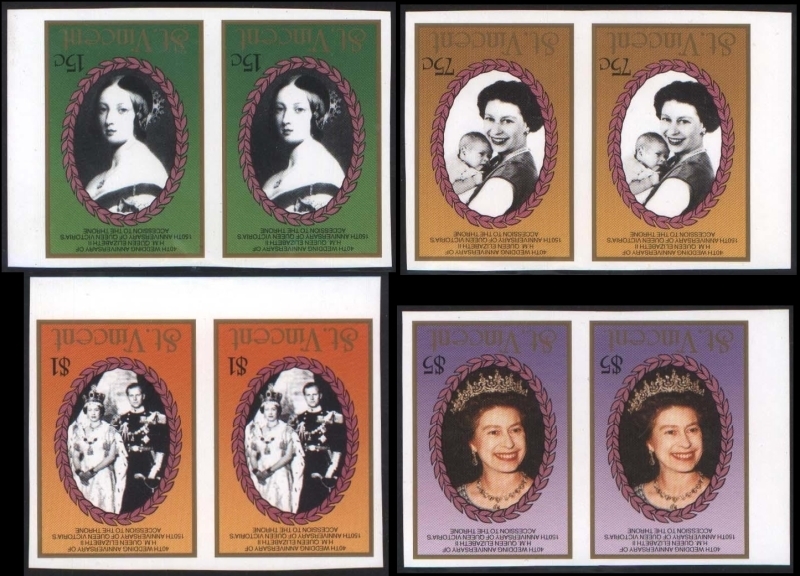 Recently large quantities of imperforates of this issue have been flooding onto the market. I have made a major discovery that thousands of Leaders of the World issues and other issues originally produced by the Format Printers have been forged as of 2014 and have been and are being sold everywhere! You can read my introduction on them here. What I have discovered for this issue is that the complete issue has been forged in the past and is being forged again now. I recently purchased blocks of ten of this issue as imperforates for around $12.00 from a Latvia based seller on eBay. The seller has and still is as I write this selling these forgeries and all are selling. 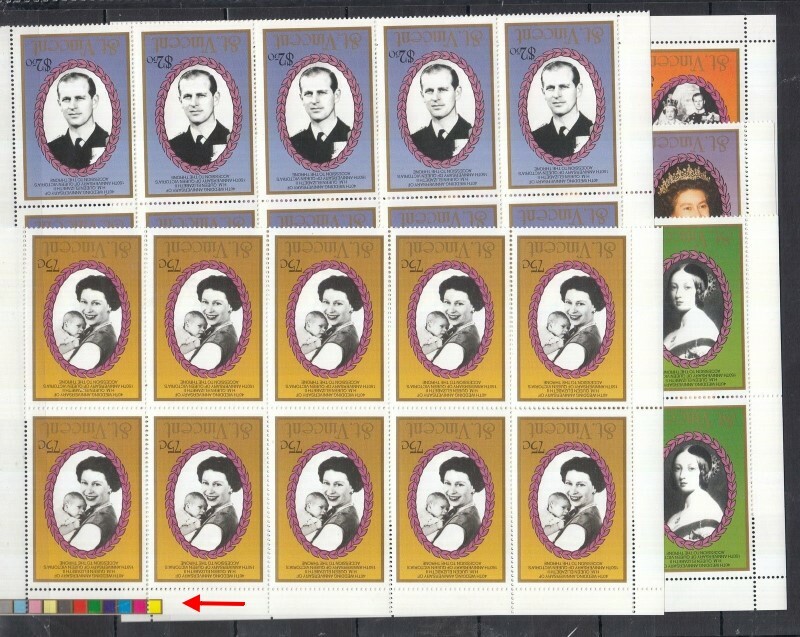 I now have evidence that practically 80% of the stamps for this issue as imperforates or Inverted Frame Errors available on the market are forgeries. You see, the $5 value was never produced by the Format Printers as an invert. If it were, it would have	been noted on the document linked above. Try to find a Proof card like the ones imaged with the $5 value and you will find it impossible. When I went and found the invert blocks imaged to use for comparison with the imperforates I just received, I was unpleasantly surprised! The gum was whiter than the imperforates! Then I got the proof cards and wow what a difference! It was time to scan at 1200 dpi and see what is wrong. 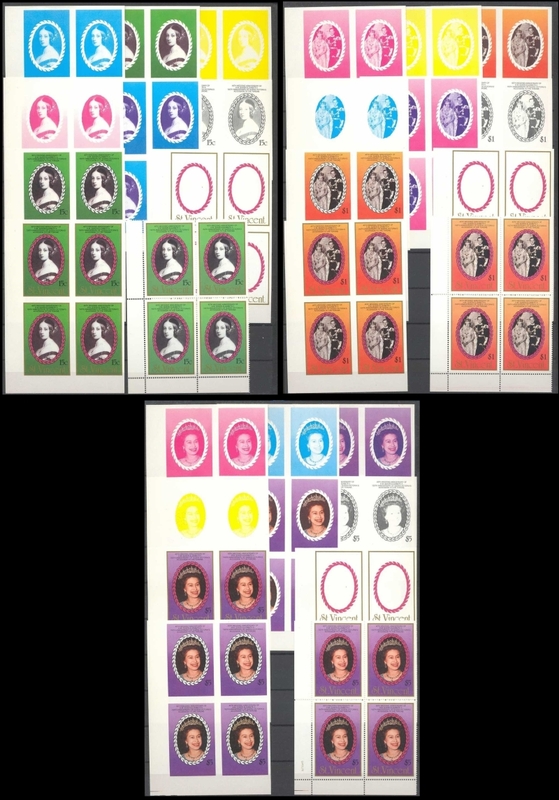 Here is an image of the gum differences between the imperforates that have just appeared recently and the inverts from the blocks. Here is an image of the two versions I have discovered. As you can see the fakes are extremely different than the originals. The color differences are obvious. Now you can compare lots on eBay and other venues and pretty much tell who has fakes and who has originals. Please visit my page on the forgeries for this issue for a more detailed description and high resolution comparisons you can compare your sets with. A number one rule is...if the $5 value is included the set is more than likely all fakes. None of these "errors" were found in the archive. It is believed that the standards of what were to be retained in the archive would NOT include "made for collector errors". The Special presentation cards do have a rarity factor. They are valued at around $25.00 each as not many are out there. To clarify more on the fake inverts that were reprinted without authorization I give you the perforation count. All the fake perforated versions of the inverts (and possibly normal issues as well) have 39 perforation holes versus the genuine versions which have 37 holes. Here is an image of the count. Recently I was scanning lots on eBay and came across a lot that proves that the Format Printers never made the "reprint" set of inverts for this issue! Here is the image from that lot. 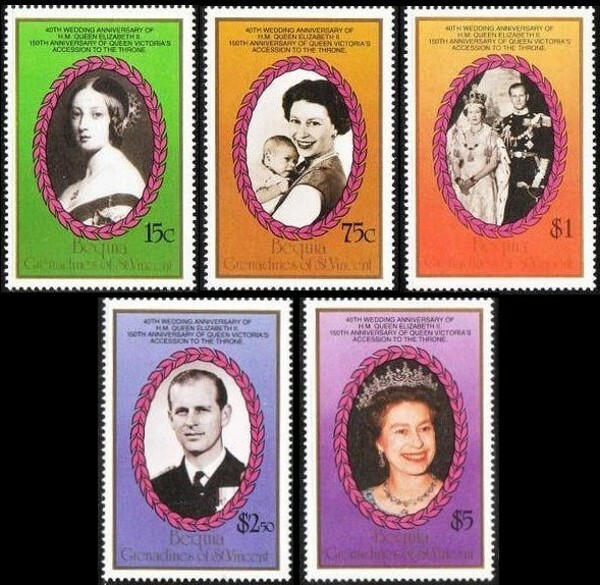 Note the white backgrounds on the stamp images. A key point that is missed is the perforations. On genuine issues you can count 37 vertical perforation holes. On the unauthorized reprinted versions there are 39 holes. Like the St. Vincent 1985 Michael Jackson and Elvis Presley unauthorized reprints they are very different perforation sizes. All imperforates are a bit more dangerous because you cannot identify them by counting perforations. They are therefore deemed forgeries and should not be sold without being permanently marked as such. Even though collectors like myself know what to look for in the colors, many will and do not know and can easily get ripped off! Note the arrow points to a color guide on the selvage. This type of color guide has been shown to be the same style used by Holders Press who were involved in producing low quality sets for Tanzania and other "reprints" of Format related issues between 1985-1987. One example is the unauthorized reprints of the Saint Vincent 1985 Michael Jackson and Elvis Presley issues. New proof showing the same style of color guides has been discovered and shown for those issues. 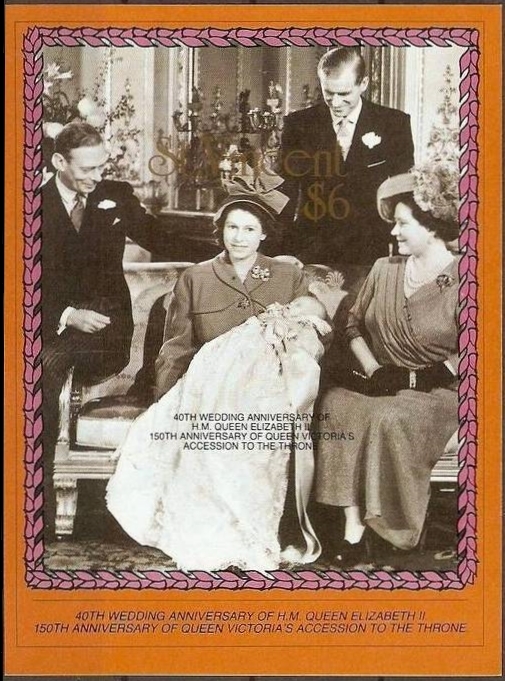 Holders Press was directly connected with Clive Feigenbaum and this is proof that the Format Printers never did reprint the inverted frame errors of the 1987 Royal ruby Wedding issues showing all reprints are forgeries. Here is another image of a lot that has now sold many times. It is full panes of the reproduced inverts. They are being sold for around $50.00 for the set! 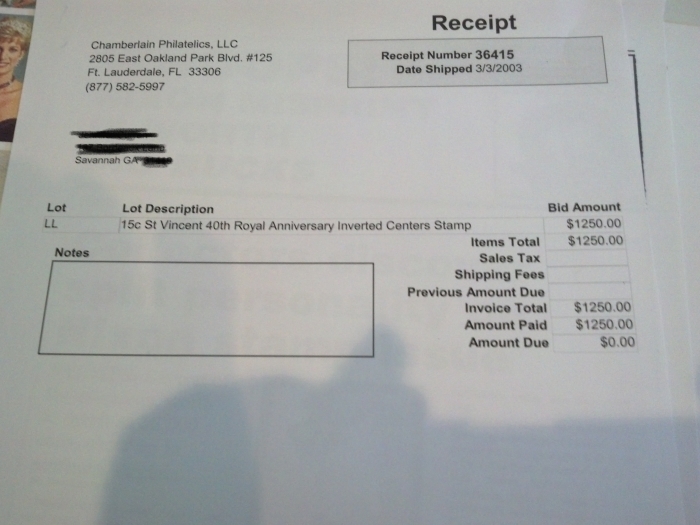 What is amazing to me is that there are still con sellers and dealers wanting $25-50.00 for one fake reproduced stamp!! 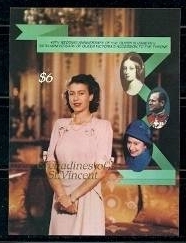 Many still trying to sell these fake reproductions for $10-80.00 for a set of singles. A set of any of these unless from the original printing by Format which does not contain the $5 value should not even be allowed to be offered anywhere! They were reproduced by a stamp dealer bent on ripping you off! Noting again the color guide at the bottom of the 75c value. Format never had a color guide like this! 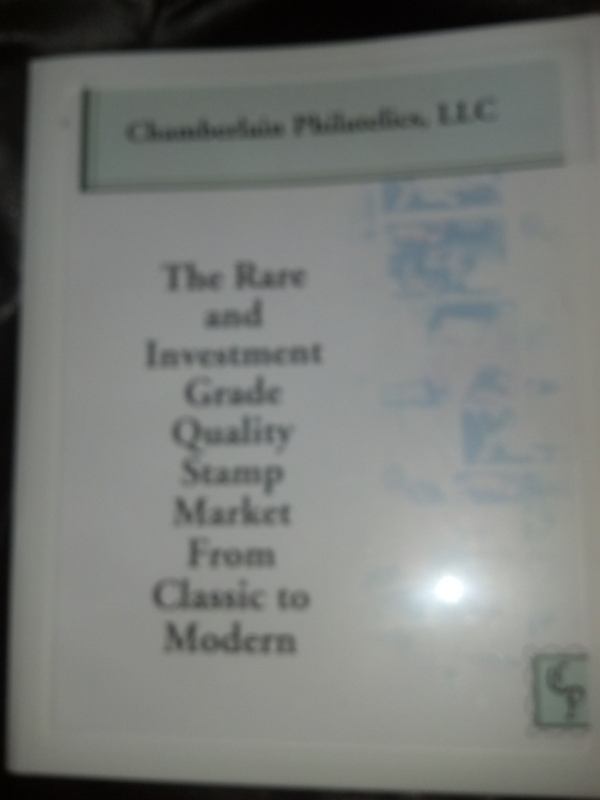 Chamberlain Philatelics located in Oceanside, California. Registered under Dana OKEY. 2182 S El Camino Real # 102 Oceanside, CA 92054-6205. This person is listed at the APS website under the Disciplinary Action Section three times! On November 1, 2000 this person was placed on probation for three years for conduct unbecoming a member of the APS. On April 1, 2002 this person was suspended from the APS for failure to respond to serious allegations of impropriety under consideration of U.S. Courts. On December 1, 2002 this person was expelled from the APS for being charged with crimes. Most people do not know what those crimes were. Here is a link to this persons involvement in bid rigging and is the reason why they were expelled from the APS. Noting this article is being lost in the pages of time and these dealers continue on as if they are are still "reputable dealers". It shows us corruption at the highest levels of our societies. I give you the link. should this link go "dead" I have also copied the article into a notepad file for preservation. Here I like to use the phrase, "We do not forgive and we do not forget.". And here is link to the notepad file should the above linked page disappear. This con artist calls potential investors and lures them. 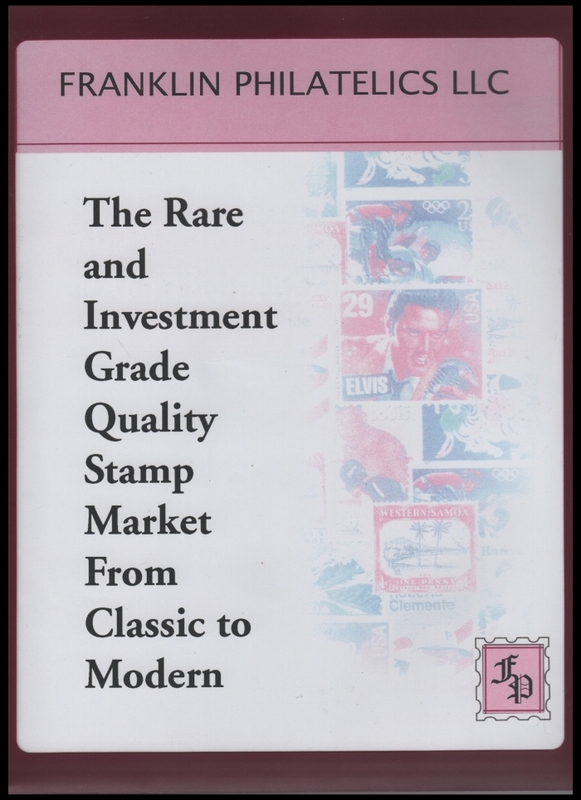 Beware of any investment companies calling you trying to sell you stamps as an investment. Trust no one in these regards unless you research them yourself! Here are images of what you will get. This person and anyone associated with them should be thrown in jail for a few years. 1987 Royal Ruby Wedding Inverted Frame Error that was sold for $1,250.00! These were never "issued" and are not a "genuine printing error"
It is interesting that this con artist keeps using the same business names with slight differences. As you can see when the heat gets heavy....they move to another state. Sadly, there are many collectors and investors out there who are being conned by these type of criminals. 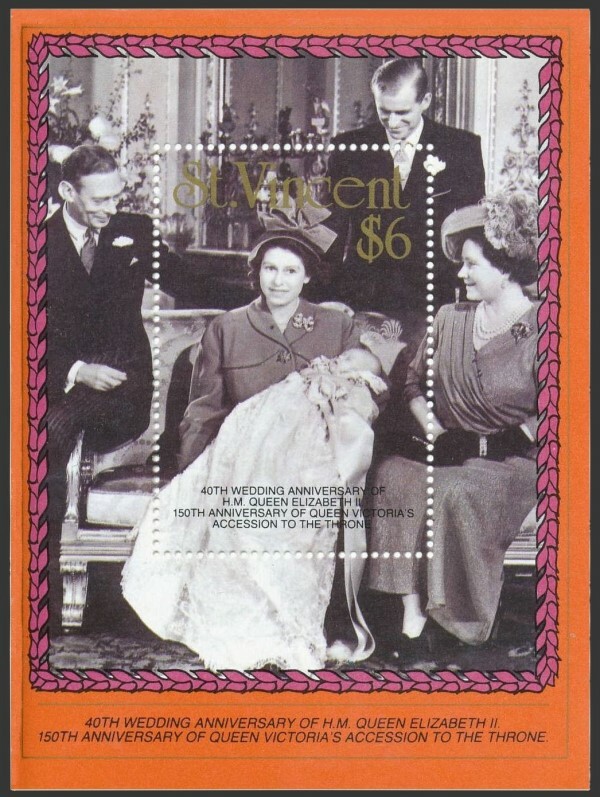 They have offered St. Vincent 1987 40th Wedding inverts, Niger Diana and Mother Teresa imperfs of which both are illegal stamps, Falkland Islands West Point Island Tiger Woods imperfs (illegal stamps), Saint Vincent 1985 Elvis inverts which are unauthorized reprints made by Clive Feigenbaum, 1986 Royal Wedding stamps with missing value errors of which around 4,000 were made, on and on! All being sold at the $1,000.00+ levels! Nothing they offer is worth more than	$20.00 tops! The illegal stamps are worth nothing! BEWARE OF SCAMMERS LIKE THIS! 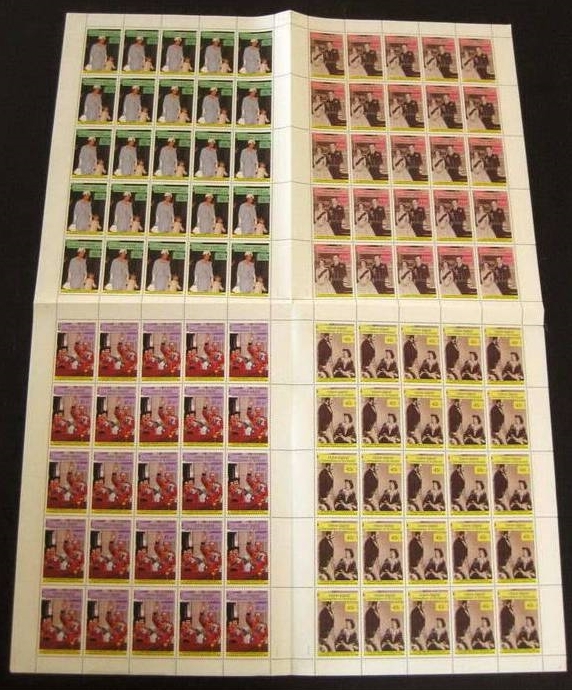 I just purchased on eBay a selection of these "investment" stamps sold by Franklin Philatelics LLC. These were sold in 2004 and 2007 when they were located in Florida and Nevada. These criminals ripped off the investor for over $11,000! 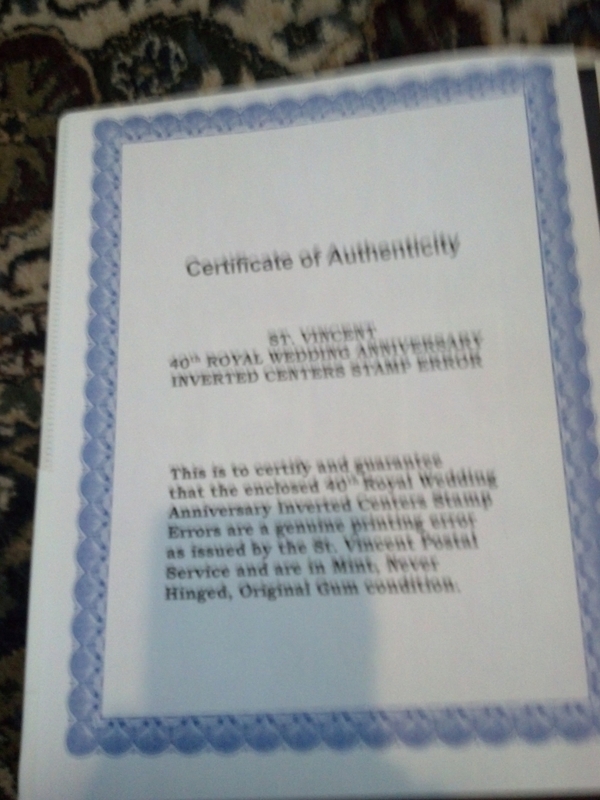 Here are images of the receipts, stamps and certificates. The certificates are bogus computer generated garbage and nothing they sell was ever "issued" as the certificates imply. Never buy anything from anyone that wants to give you certificates like these. 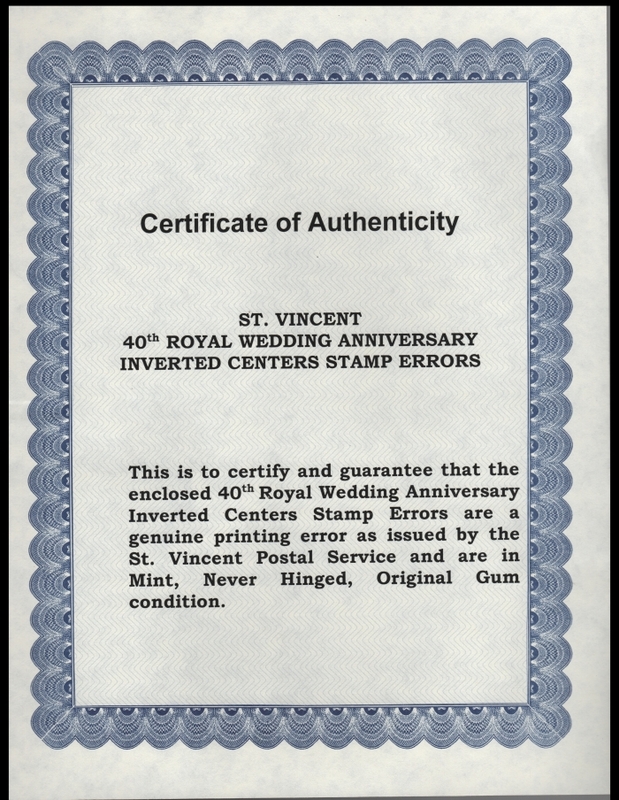 Saint Vincent 1987 40th Wedding anniversary Inverted Frame Errors that were sold by Franklin Philatelics LLC for $3,900.00! These were never "issued" and are not a "genuine printing error". Note it is almost the same certificate as the Chamberlain one. Totally bogus! 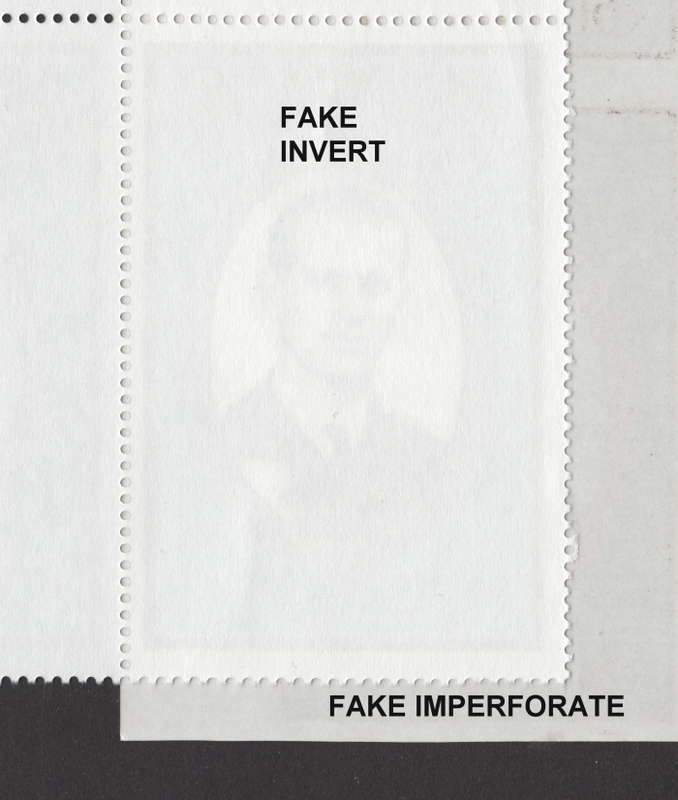 Here are examples of these error stamps in imperforate form. The $2.50 stamp is also in this form. The seller I grabbed this image from is asking $2,000.00 for this group! Completely OVER INFLATED and should not be dealt with on any terms. Evidence points that these are probably in existence in close proximity to 5-10,000 sets. Value at maximum should be $1.00 a set as a novelty. They are fakes! Again...no $5 value was made by Format. Here is a bad image of one "error". The seller of these seems to have THE WORST images of stamps on the internet! Half the time he has no images at all. Is this on purpose? The asking price for this stamp is around $60.00. Supposedly this seller also has the $5.00 with the same "error". Noting he has a "Call for Price" link under it. Until proof is presented these are Format produced "errors", it also falls in the category of "made for collectors" and probable fake reprints and one should pay no more than $5-10.00 for either value. Evidence is pointing toward at least 1,000 to 5,000 existing. Another auction site named Universal Philatelic Auctions based in the UK is offering the $5 value with missing black inscriptions at £62. Here is the image from them. Looks genuine to me. Definitely not worth it though as standard practices of the printer at the time was to produce 5,000 "errors". Worth maybe $5-10.00 tops as a novelty. I would not buy it for the price asked namely because some dealers hold thousands of these "errors" in their stock never revealing they have them. Based on market scanning and analysis it is safe to say these are quite common. 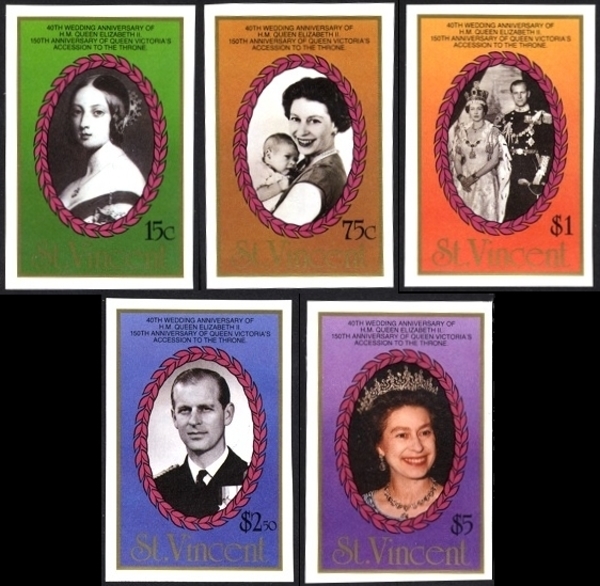 Price variances from $6-7.00 to $50.00 a set of singles and $5-25.00 for the souvenir sheet shows that some dealers are OVER INFLATING the value again. One should pay no more than $15.00 for the set of singles and no more than $15.00 for the souvenir sheet in this condition. Evidence points to quantities between 2,000 to 5,000 existing of the singles. 1,000-2,000 souvenir sheets existing. 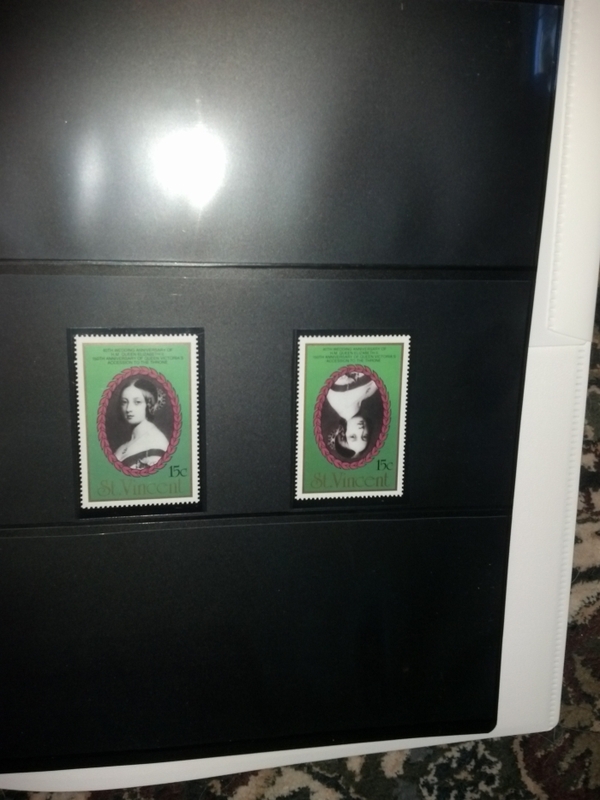 As of 2015 I can now see the above imaged imperforate set are fake reprints. I have discovered recently created (2014) forgeries of this issue! 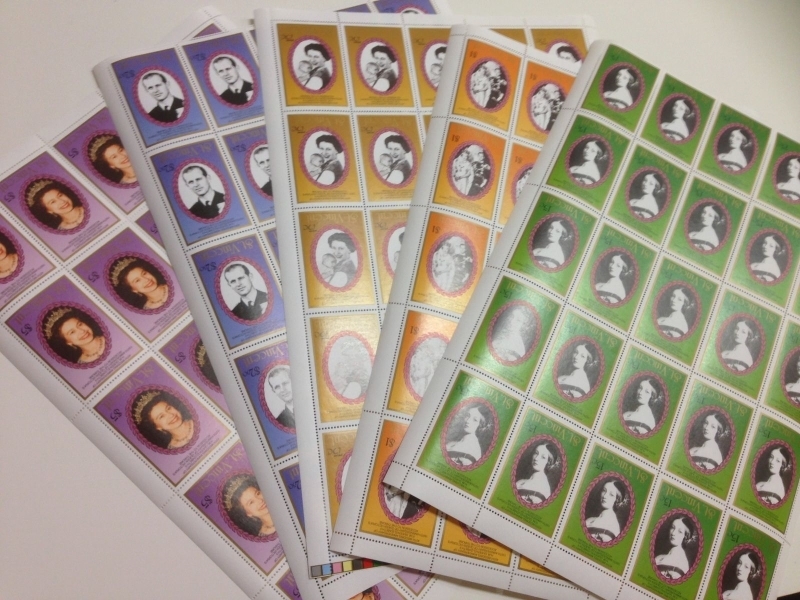 Fake imperforate souvenir sheets are on the market as well! Don't get ripped off! View the forgery page to define and avoid them. These examples I found were for sale at around $20.00 each set. A fair price for these. If a seller asks for more than $30.00 for the color proofs in blocks of 4 for each value they are asking too much. In other words a full set of single Progressive Color Proofs should be priced at no more than $40.00. A single value in single form of these value should be set at $7-10.00 a set. 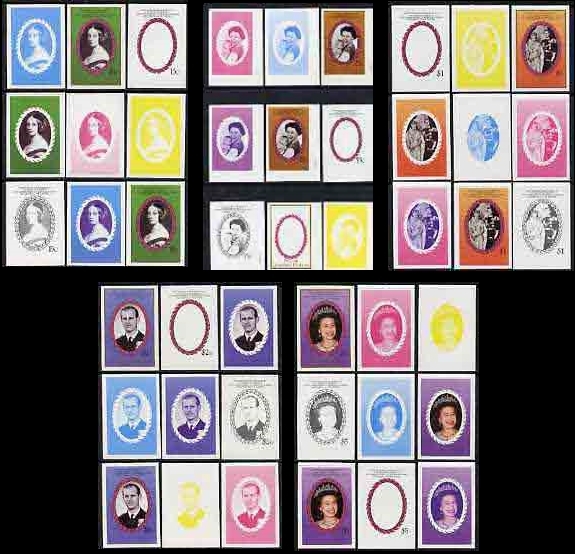 The standard practice of the printers was to produce 3,000 sets of progressive Color Proofs thus we can be confident that this is so with this set also. I found only the souvenir sheet for sale with SPECIMEN overprint. Selling for around $5.00. Could find no singles nor sets of singles with the overprint. Do any exist? Possibly not as there were soooo many variances of the singles printed there was really no need for SPECIMEN overprints on this issue. I could be wrong here though. If evidence is found it will be posted here. No errors reported for this issue. Very little is available on the market today. This shows that there is a rarity factor for these. The seller wants around $6.00 for this one. What would a full set cost??? Again since it exists then probably the 3,000 set factor is in range. Time will tell. 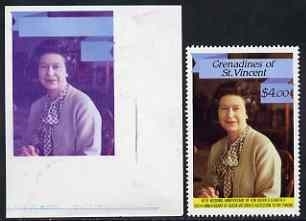 No SPECIMEN overprinted stamps nor souvenir sheets for St. Vincent Grenadines 1987 Royal Ruby Wedding set found for sale. Very little is available on the market for these also. These seem only available through the Stampdile network. A set will cost around $30.00 for the singles. Judging from availability the price is fair. They do not offer the souvenir sheet. It was offered for around $7.00 elsewhere. A fair price indeed. Again the above mentioned quantities apply. Again, very little is available on the market. Only place found again is on the Stampdile network. A set of these will cost you around $200.00. Quantities are unknown at present but more than likely the same as noted. No singles sets are for sale on the market at present time. This imperforate souvenir sheet is selling at around $10.00. Only the 15c, 45c, $1.50, and $3.00 stamps can be found with the SPECIMEN overprint. As you can see they were all printed on one big sheet. The $4.00 value was printed separately and no sheets were found in the archive with the overprint. This is the only possible explanation for the missing value from the set. The singles set is being offered for $10.00. No souvenir sheets can be found with the SPECIMEN overprint. 1.) Saint Vincent Postal Authorities seemed not to care WHAT the printers did with their issues. 2.) 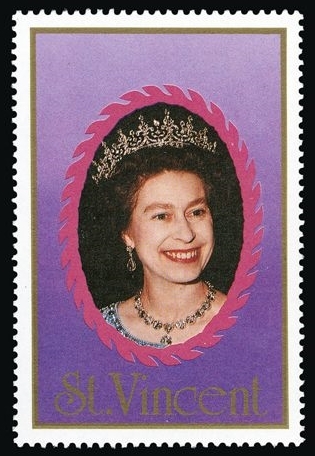 The company produced quite a few "made for collector" errors for this country between 1986-7. 3.) 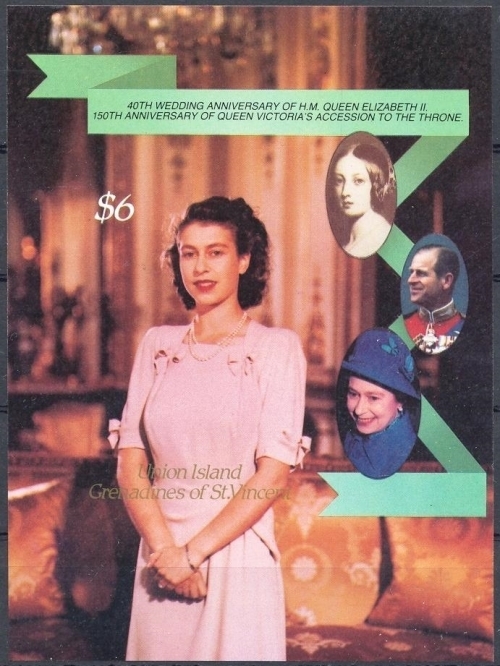 The company produced and held onto a large number proofs and color trials for various (what they considered) popular issues meaning LOTW issues and topical issues and yes, royalty issues for Saint Vincent. As we can see in the declining numbers of items available variety wise with the dependencies, they obviously at the time thought that the dependencies would not be as popular and thus less material was produced for them. This same method appears to be apparent with other commonwealth countries also such as Tuvalu and its dependencies. High numbers for Tuvalu and lower numbers for the dependencies. Luckily the whistle was blown and this type of production was put to a screeching halt in late 1987 and early 1988. Some materials were destroyed before police raids could get to them. Inside sources are now portraying the picture of what happened to some of the materials. Some quantities of sheets with errors were quickly sold off to investors who quickly got them off their hands before the raids. Investors who bought them, out of fear, locked them away and never resold them. Some destroyed the materials out of fear. SOME of the materials may STILL be locked away. Certain sources are now retracing the trails to find out what happened to them. As time goes by more and more information will be found and truths will be revealed. Shady dealers will be revealed and scorned. 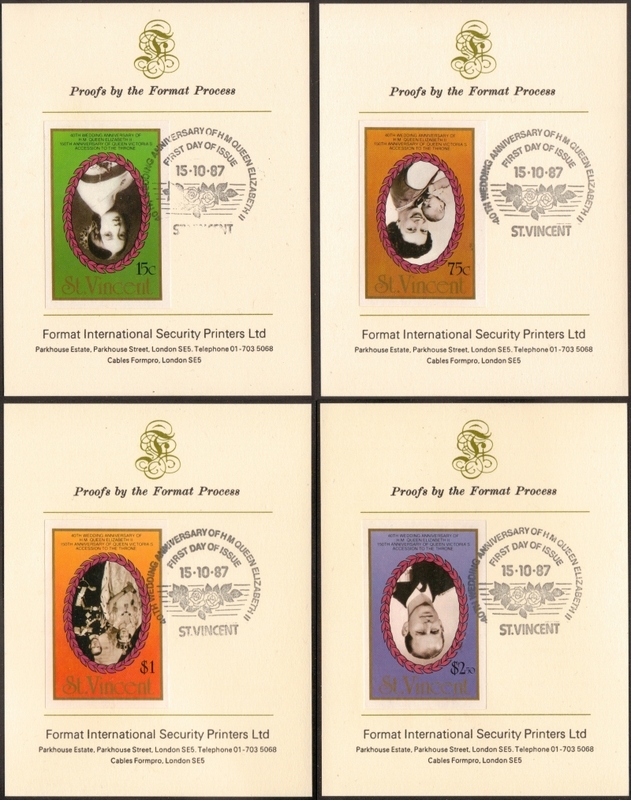 Pricing of these materials will be stabilized and most of what the Format International Security Printers produced will be shown to have been legitimately made and saved in the archive.